I was expecting a delirious film, but the delirium is not quite what I had anticipated. In one of a number of disconcerting moments in the course of Nicholas Ray’s Bitter Victory, an enlisted man assigned to Captain Leith (Richard Burton) and Major Brand (Curt Jürgens) sits at a bar. To the amusement of his companions, and, one suspects, very much as an act of privately motivated sarcasm, he conjures up the battle that lies before him and his compatriots with his animated hands and the explosive noises he imitates through his pursed lips. This comic yet undeniably odd episode occurs concurrently with one of the main plot turns of the narrative. In the course of a superficially civil exchange, Leith is publicly introduced to Brand’s wife, Jane (Ruth Roman). As he watches them and listens to their exchange of social pleasantries, the Major recognises not only that the two of them have been previously acquainted but also that their established relationship was romantic in nature and substantial in its impact. In effect, the glances which pass between Ruth and Leith and the tone of their dialogue implants a kind of emotional explosion into the encounter, much as the soldier at the bar detonates the festive atmosphere about him with his hand gestures and sound effects. Yet why does Ray choose to have them occur concurrently, particularly in that the soldier proves to be the sole casualty of the assault on the German encampment? Is he meant to serve as a behavioral analogue to the principal characters or as a interpolated commentary on the manner in which all conflict, emotional and military, in the film comes across as something of a charade, a foundationless construction instigated with a predetermined conclusion. Whatever the intention, the effect remains disquieting, but so does the whole of Bitter Victory, a war film that depicts armed conflict without any degree of heroism and romance without any possibility of fulfillment. Reading the account of the production of Bitter Victory in Bernard Eisenschitz’s biography Nicholas Ray: An American Journey illustrates how the perplexity on screen mirrored the shenanigans that took place behind the camera, ranging from the incessant interference of the producer to the intemperate lack of cooperation by some actors, particularly Curt Jürgens. One gets the feeling that the screenplay was cobbled together under the same kind of duress that the soldiers encounter in their ill-fated mission: Ray staying up into the wee hours trying to make sense of the task at hand and then having it all become even more complicated when the pages of additional dialogue credited to Paul Gallico were handed to him each morning. Eisenschitz captures this crazy quilt quality in his witty observation that mise en scène transforms into mise en crise before us (2). Is that how to account for certain unfathomable details that occur time and again in Bitter Victory? Consequential noises that occur off-camera but without illustration of their cause, as when a plane drones above Leith and the Arab (Mekrane, played by Raymond Pellegrin) following the death of the Scottish Private Roberts (Andrew Crawford). Actions that arise out of some kind of behavioural abyss, as when Leith cries out after having killed the German guard as though he were the injured party. The memorable lapse into temporary incoherence by Private Wilkins (Nigel Green) as they escape the Germans into the desert. You get the sense that this last episode was included for no more reason than that Ray took some playful glee in Green’s unusual personality, one that only a few films appropriately exploited before his untimely death in 1972 from an accidental barbiturate overdose: Sidney Furie’s The Ipcresss File (1965), the cult classic The Face of Fu Manchu (Don Sharp, 1965), Andre de Toth’s Play Dirty (1968) and John Huston’s The Kremlin Letter (1970). Ray is said to have thought that the eyes communicated more than any piece of dialogue, and something in Green’s orbs undeniably communicated disorder, a gleeful leap into the void. The fact that a peripheral character commands our attention at the expense of the thrust of the plot attests to the wayward quality of Bitter Victory. What, for that matter, does Ray do with the ample canvas of Cinemascope? He does not show us either snakes or funerals, the format’s only fit subjects according to Fritz Lang, but instead displays, for the principal portion of its running time, an enormous expanse of … nothing. The bare waste of the desert. The characters amble through a featureless territory for which their spirited training in the memorable gymnasium filled with dummies provides not an ounce of preparation. And whom are these soldiers meant to follow in order to assure their survival? The commanders seem less leaders of men than unhinged individualists, each bound to an ultimately solitary code. Leith appears obsessed by some privately motivated romantic set of gestures that come down to a kind of vain obsession with oblivion. Brand reminds one of a kind of intemperate schoolmaster who cleaves to his lesson plan even while his students gaze upon him either with contempt or confusion. The lead actors fill in the outlines of their characters with extremely broad brushes, intent on details unhinged, at times, from the needs of the ensemble. They seem peculiarly attuned to individualised agendas, like some jazz musicians who remain soloists even when part of an ensemble. (Art Tatum comes to mind here.) Burton plays Leith as though he occupied the screen without costars, his luxuriant diction grants his lines a sort of lush desperation played to the desert air. Jürgens’ stiff posture and rigid tone of voice make one think he wishes he were anywhere else but on location in North Africa. Ruth Roman effuses nothing of the kind of obligatory eroticism that would make the film’s romantic triangle convey even a modicum of conviction. At times, a viewer of Bitter Victory feels as estranged from these characters as they come across to one another. If David Thomson is correct in suggesting that Ray’s paramount interest lies in “the piercing enactment of human solitariness”, then this film could well be an exemplary test case for his peculiar genius (3). Very little separates the characters from the stuffed figures in the gymnasium such that Brand’s climactic gesture of pinning a medal on one of their chests comes across not only with a kind of dramaturgic inevitability but also as a kind last-minute of directorial confession that his narrative has amounted to a nullity. 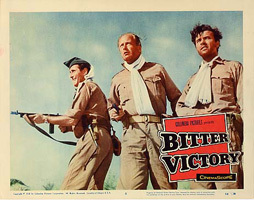 The delirium that Rohmer attests to pervades Bitter Victory as completely as the windstorm, occurring just before the soldiers that survive the mission are picked up, seals Leith’s fate. Had Brand wanted to save him, as he tells his wife, and, if he did, what would follow? Leith confesses to Brand just before the storm hits that he does not wish to be saved, only to add, “I always contradict myself”. Such an exchange commits itself to an abandonment of coherence as do the orders given to Brand by General Patterson (Anthony Bushell) at the start of the mission: “I need not remind you that you’ll be entirely responsible for the lives of 30 men… all expendable”. Did Ray consider himself responsible to his audience or his actors or anyone for the resolution of the interpersonal drama he lays out or the philosophical puzzles his film explores? To demand an answer would be to dissolve the very delirium that makes Bitter Victory a memorable if confounding narrative. David Thomson, The New Biographical Dictionary of Film, Alfred A. Knopf, New York, 2002, p. 713.